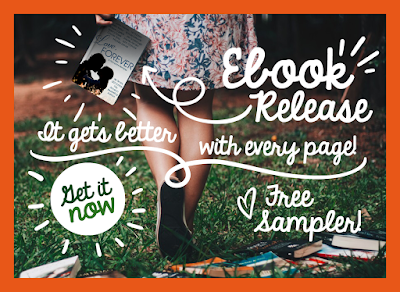 I'm a part of a group of authors who blog over here and we decided to create a freebie set of sampler chapters for our readers. If you want to try out a group of authors for free, just download this set and get 11 first chapters of bestselling author's books. Our hope, of couse, is that you'll find one or two you love and you'll want to read the rest of the stories. 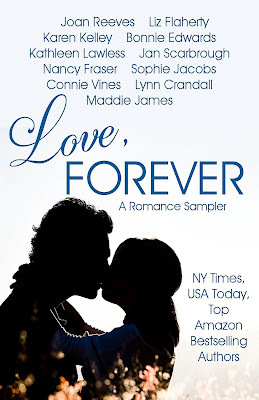 This sampler collection of romance first chapters by established, award-winning, and bestselling romance authors is guaranteed to whet your happily-ever-after appetite and send you running to your favorite ebook retailer to download to your hearts’ content! This eclectic mix of sweet to steamy reads has you traveling from the past to the future, with historical, time travel, paranormal, contemporary, western, and futuristic romance beginnings. And we hope you will not stop at the beginning! Our stories are available in a wide variety of ebook retailers world-wide—we hope you download and enjoy every one! Amnesia stole her memory—her life! What Tessa doesn’t remember may be the death of her. Trouble is something hard-edged rancher, Brede Kristensen, knows all about. A widower with a rambunctious young daughter, a ranch to run and an ornery cook who has just runoff, Brede doesn’t need another problem. Yet in the midst of a violent storm, he finds an injured woman with no memory of her past—or the man who tried to kill her! Mercy Talbot left Welcome on a high, but she’s returned a broke failure. She’s messed up her career, love, and family ties. Now, she’s found love and a new family. When her career is reborn, will she leave the man and child who’ve opened their hearts to her? Will Kate and Matt's accidental trip to the future bring them back together? Or, tear them even farther apart? Widowed Cass Logan has done her time as a caregiver. But when her boss, mystery-writer Eli Welcome, needs surgery, Cass is faced with following her heart...or walking away. Happy-go-lucky Suzie Hart has a perfect life and a secret. All goes well in her small town world until that secret rides up to her doorstep on a badass Harley and tosses her not-so-perfect world into some kind of big, bad tumble. It’s up to Reggie to save what’s left of her family homestead and her proud Kentucky heritage. But when Parker shows up to collect his horses, all bets are off. Reggie’s never been a gambler and Parker despises losing. But when Kentucky blue blood tangles with British blue blood, are they willing to take a gamble on love? Anora King didn’t plan to pretend she was married, but her new neighbors in Boulder Springs jumped to that conclusion. Jesse Quantrill is shocked to find himself lusting after a married woman. And wouldn’t a romance between them be the town’s biggest scandal ever? A bird-shifter. A reclusive billionaire. A project that brings them together. A deadly curse that threatens to separate them forever. Mala didn’t plan to crash land on Earth. She only wanted to sneak in for a few days and maybe find a man—a real one, but she encounters more than she bargained for with the town sheriff. Claire Winslow vacations on an East Coast barrier island, content with her life and her potential future—until the illusion of a man walking the misty shore haunts her. Then one kiss—a beautiful, soulful, stolen kiss in the night—and her life changes forever.